Updating this event post with additional information regarding the event such as carpool times and locations and required gear. 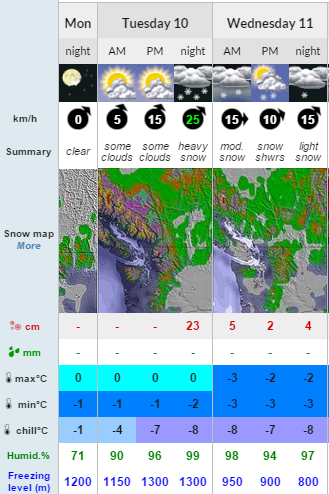 Well it looks like we have some snow in the forecast and early season trip reports show that the Mt Baker Wilderness is looking in decent shape. Bring out your rock skis and lets go get some turns in! Carpool location will be the Tim Hortons on Sumas Way in Abbotsford. Drivers must have winter tires on their vehicles as per Washington law. Carrying chains is also highly recommended. Our destination will be Table Mountain area or the Shuksan Arm, I'm also open to the potential of Skyline Ridge which is on the west side of Mt Baker and may see more snow than the east side. Also if you could summon Ullr for us to dump 3ft of fresh that would be really nice. Event Directions: From The Sumas Border Crossing Turn Left on Front Street And follow State 547 to State 542. Drive past the Mt Baker Ski Area Lodge to Artist Point. Carpool Cost: Approximate vehicle expense for this event is $37.50 (calculated at total Km * $0.25, effective Friday, April 26, 2019). This is based on the current provincial government rate for private vehicle use. Please pay your share of the cost to the carpool driver.